The goal of this paper is to present tools which allow informal firms to improve their social and environmental performance and become sustainable enterprises. The paper first provides an overview of the informal economy and sustainable enterprises from the perspective of the International Labor Organization. The methodological part consists of a presentation of tools which can be used to facilitate the transition of informal businesses to formality. Tools are divided into two groups: Those which require the active participation of private partners, and others which are based on partnerships between public and private entities. Applications of tools from experiences in different developing countries and mainly from projects run by the International Labor Organization are presented and their achievements and limits discussed. The paper concludes that a more focused approach on the informal economy should be adopted if more positive results are to be achieved in terms of improved social and environmental performance of enterprises. In addition, it highlights that the impact of actions on informal firms should always be monitored and reported even when the focus of projects is not on the informal economy. L’objectif de cet article est de présenter les outils qui permettent aux entreprises informelles d’améliorer leurs performances sociales et environnementales afin de s’inscrire dans la durabilité. Cet article s’ouvre sur un aperçu de l’économie informelle et des entreprises durables du point de vue de l’Organisation Internationale du travail. Il se poursuit par une partie méthodologique qui consiste en une présentation des outils permettant d’aider les entreprises de passer de l’état informel à l’état formel. Ces outils se répartissent en deux groupes : ceux qui nécessitent la participation active de partenaires privés et ceux basés sur le partenariat entre entités publiques et privées. L’article présente ensuite les applications des outils basées sur des expériences menées dans différents pays en développement et principalement sur des projets pilotés par l’Organisation Internationale du Travail, puis aborde les résultats et les limites de ces applications. L’article conclut sur la nécessité d’adopter une approche davantage axée sur l’économie informelle si les entreprises parviennent à améliorer leurs performances sociales et environnementales Il souligne par ailleurs que l’impact des actions sur les entreprises informelles exige un suivi et un reporting réguliers même lorsque les projets ne sont pas ciblés sur l’économie informelle. El objetivo de este artículo es presentar instrumentos que permitan a empresas informales mejorar su rendimiento social y medioambiental y convertirse en empresas sostenibles. El artículo proporciona primero una visión general de la economía informal y de las empresas sostenibles desde la perspectiva de la Organización Nacional del Trabajo. La parte metodológica consta de una presentación de instrumentos que pueden utilizarse para facilitar la transición de empresas informales a la formalidad. Los instrumentos están divididos en dos grupos: aquellos que requieren la participación activa de socios privados, y otros que están basados en asociaciones entre entidades públicas y privadas. Se presentan aplicaciones de instrumentos de experiencias en diferentes países en desarrollo y principalmente de los proyectos llevados a cabo por la Organización Internacional del Trabajo, y también se tratan sus logros y límites. El artículo concluye que debería adoptarse un enfoque más centrado en la economía informal si se quieren lograr resultados más positivos en términos de un mejor rendimiento social y medioambiental de las empresas. Además, destaca que el impacto de las acciones en las empresas informales siempre debería ser objeto de supervisión e informes, aún cuando el objeto de los proyectos no sea la economía informal. The opinions expressed are solely those of the author and do not necessarily reflect those of the International Labor Organization. 1The goal of this paper is to present tools which allow informal firms to improve their social and environmental performance and become sustainable enterprises. These tools pursue the final goal of making informal economic units achieve formality. 2The paper will first provide an overview of the informal economy and sustainable enterprises from the perspective of the International Labor Organization (ILO). It will then highlight some characteristics of the behavior of informal enterprises with regards to decent work1 and the environment. The methodological part of the article will describe tools which help informal units head towards formality and improve their social and environmental performance. Such tools require the active participation of either private players alone or partnerships between public and private actors. Finally, results in terms of the applications of those tools will be discussed, including their limits and both actual and potential positive impacts, starting from concrete experiences mainly stemming from the ILO. 7The “informal economy” takes into account informal workers and units across sectors. Therefore, the term “informal economy” is preferable to the commonly used expression “informal sector” (ibid.). 8Informal activities “are not included in the law” when they remain outside the scope of existing legislation. They may also not be covered by law in practice, which means that the law is not applied or enforced. Activities can be informal also because existing legislation discourages compliance due to its being inappropriate, burdensome or simply too costly (ibid.). For example, an enterprise can be informal when it is not registered, but there may be elements of informality also when it does not pay taxes, has employees who are not formally recruited, or does not provide to its workers all the social protection benefits to which they are entitled according to national legislation. 9In developing countries, the informal economy constitutes between 35 to 90 % of total employment. It largely consists of self-employment: 70 % of the total informal economy in sub-Saharan Africa, 62 % in North Africa, 60 % in Latin America and the Caribbean, and 59 % in Asia (ILO, 2009 and 2011). 10The majority of enterprises in the informal economy produce legal goods and services (ILO, 2002). Informal entrepreneurs can be street vendors, taxi drivers, but can also be involved in activities such as construction, food production and many others. The informal economy is characterized by informal institutions, such as social norms, attitudes, values and traditions which vary on a national level (ILO, 2011), and often even locally. Some of those traditional rules and norms result in undesirable practices and outcomes in terms of decent work and development (Nübler et al., 2009). 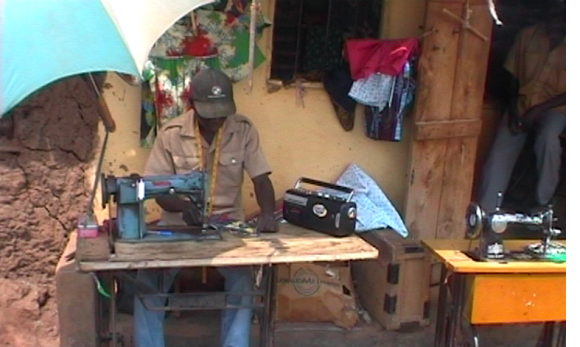 This is why specific tools to upgrade informal firms to formality are needed. Because of the specific context-based characteristics of informal firms, such tools must be adjusted to national and local needs. 11In 2007, the ILO identified “responsible stewardship of the environment” as one of the pillars of an environment conducive to the creation and growth of sustainable enterprises. It was concluded that: “In the absence of appropriate regulations and incentives, markets can lead to undesirable environmental outcomes” (ILO, 2007a, pillar 17). This is why tax incentives and regulations should be used to pursue sustainable development (ibid.). Environmental sustainability and the informal economy are cross-cutting themes of the ILO’s overall strategy for the promotion of sustainable enterprises (ILO, 2007b). 12Some suggest that small and micro-sized firms do not consider environmental issues as important (Hutchinson and Chaston, 1994; Vickers and Vaze, 2009). This is due to both financial constraints and lack of knowledge (ILO, 2008). Their behavior can be improved through market-based instruments and regulations. However, such mechanisms are ineffective to change the attitude of informal businesses. Alternative tools must therefore be sought and used to improve the social and environmental performance of informal units. 13All enterprises including informal ones should comply with international labor standards in order to be socially sustainable. The four core areas of labor standards to be considered in this regard are freedom of association and collective bargaining, non-discrimination, and the absence of forced and child labor. Regrettably, no equivalent core areas of environmental standards exist in order for companies to be deemed environmentally sustainable. Reference can be made to national legislation, but in some countries, particularly poor ones, there is no adequate environmental legal framework. Some ILO legal instruments as well as others from different specialized international institutions contribute to the creation of a body of international environmental standards. Of special interest in this respect are ILO conventions and recommendations dealing with occupational safety and health, and chemical and dangerous substances (De Gobbi, 2011). 14The 1972 Kenya report of the ILO World Employment Program describes the informal economy for the first time. The informal sector is presented in positive terms and praised for its efficiency, innovativeness and dynamism. Informal enterprises are said to be dynamic and creative, in that changes may occur very rapidly and without being limited by the slow processes which formal companies have to deal with (Bangasser, 2000). 15The creativity of informal businesses in the area of stewardship of the environment has developed, especially on waste collection and recycling (UNEP, 2011), where working practices and conditions are very poor. No other relevant experience on the active role of informal enterprises in environmental protection has been reported so far (De Gobbi, 2011). Technological innovation, which is key for environmental protection, requires investments and knowledge to which informal units do not have access (ILO, 2008). 16Formality is the main way through which small informal units can actively participate in environmental protection. Following is a short description of tools which can be used to that end. Many of these tools have been traditionally introduced by the ILO and used to improve social conditions of economic units, including informal operators. Some of them are being updated by adding an environmental component. Others will hopefully soon undergo a similar process. 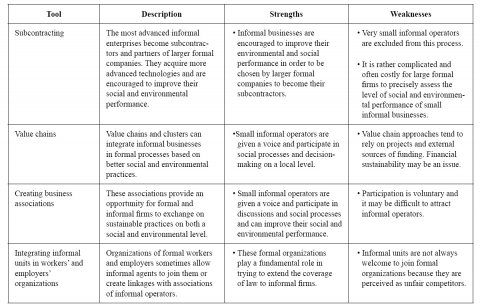 17This section describes different tools which can be used to allow informal enterprises to head towards formality and improve their social and environmental performance. The tools have been identified through a careful consideration of ILO project reports and other official documents on the informal economy, given the internationally recognized leading role and vast experience of the Organization in this particular area. 3 This definition is drawn from one which was formulated for internal use at the ILO in 2007. 18In the present paper, a tool is considered to be an approach, a strategy, a methodology, a training material, a good practice, or an organized network contributing to the achievement of decent work.3 Tools are divided into two groups reflecting the formulation of the issue presented in section 1.1 and as proposed at the international conference on "Reconciling poverty eradication and quality of the environment". One group includes tools which require the active participation of private partners, and the other covers tools which are based on partnerships between public and private entities. Each group will be presented in a separate table highlighting the strengths and weaknesses of the different tools based on findings mainly contained in ILO reports. 19The following sub-sections will focus on the level of implementation of the tools described above and will present and discuss the results obtained through their application. In some cases, where no application can be reported, potential implications will be explored. 20Legal frameworks and mechanisms to enhance compliance are effective measures to improve the behavior and performance of formal businesses. For informal enterprises, the provision of training, information and participatory approaches have proven to be more efficient initiatives (ILO, 2009). The tools whose applications are presented below mainly fall under the latter types of interventions. 21Unfortunately there is seldom precise quantitative data available on the impact of the experiences presented below on informal operators. The main reason accounting for this lack of information is that the tools considered often do not specifically target informal enterprises and therefore their impact on such a group of economic agents is neglected. 22Several examples can be mentioned where medium and large formal companies interact with informal enterprises and contribute to improving their social and environmental performance and the quality of the goods and services they deliver. 23The ILO STEP IN program in Zambia supported the transformation of traditional meeting places for informal operators into Centres where end users working in informal enterprises could meet service providers to determine the kind, quality and price of the services (ILO, 2011). 24Other examples of sectors where advanced technologies and new and higher skill levels have been acquired by smaller informal firms through subcontracting from larger formal companies are the construction and civil engineering industry in Morocco and Senegal, the metal and beverage industries in South Africa, palm oil production in Cameroon, and weaving in Ethiopia (ILO, 2009). 25Some large enterprises are committed to knowing about and improving the social and environmental practices of their suppliers. However, obtaining accurate information about subcontractors at a reasonable cost is a challenge. For instance, the formally merged company, Cadbury Schweppes, producing food and beverage, focused on improving the labor practices of its supply chain. This included about 40,000 producers. Many of them being small farmers depended on many layers of middlemen, and were in the informal economy and almost impossible to reach (Vogel, 2006). 26Nike has recruited 100 employees to monitor suppliers. In addition, it uses the services of accounting, health and safety, and environmental firms to have external verification of compliance with financial, social and environmental standards. But Nike's remarkable efforts primarily target its direct suppliers, and only very few of its smaller subcontractors in different developing countries are monitored (ibid.). 27IKEA does not accept any wood from illegal logging. It therefore traces its suppliers to the forest of origin. By so doing, IKEA cuts out middlemen, reduces costs and increases its chances to ensure compliance with environmental standards in its entire supply chain (Higman and Poole, 2009). In 2000 the same company launched a carpet project in India to improve the labor practices of its supply chain. The main purpose of the project is to prevent child labor. The project covers 1.5 million people in 650 villages. Although IKEA does not want its rugs to be made by children, it does not claim that it can monitor all the people involved in carpet making in India who are largely operating in the informal economy (Vogel, 2006). 28Some multinational enterprises adopt sustainability policies and codes of conduct and require that their suppliers comply with them. Philips is an example of such a company. Suppliers are audited at their own costs in order to be acceptable subcontractors. Firms with a poor performance are sanctioned and their contracts terminated (De Gobbi, 2011). Meeting the social and environmental requirements of large companies can be extremely expensive for small firms, and this may lead to only larger, formal suppliers being chosen as subcontractors (Vogel, 2006). 29The ILO has developed a tool to identify sub-sectors in a given locality which have a high growth and poverty alleviation potential (see ILO, 2007c). A participatory approach is used to select sub-sectors. Value chains are strengthened through business development services, including association-building, clustering, skills training, mentoring on improved production methods, and the organization of discussion forums where issues are addressed and solutions found. Both formal and informal enterprises participate in the application of the tool which has been used in Viet Nam and Sri Lanka (DCED, 2011). 30The ILO value chain approach is often used in rural areas where economic units are mostly informal. However, no specific information is available on the beneficial impact of this tool on informal enterprises. Considering the overall positive results obtained through the application of this approach in general (ibid. ), one can conclude that positive effects on informal operators are likely to have been achieved. 31In Sri Lanka, most of the processes and services launched and provided during the period of project implementation are still available through private sector interventions two years after the end of the project. However, a weakness of the value chain approach in general may be the very likely dependence on external financial and technical support of those processes and services which are necessary for the improvement of social and environmental practices of informal businesses (De Gobbi, 2011). 32A particularly meaningful example of a business association for informal operators is the Self Employed Women's Association (SEWA). This very successful association groups over 1.3 million informal agents in seven states in India. It provides a wide range of services to its members, including information and training (www.sewa.org/). 33SEWA improves the social and environmental performance of informal operators also through strong linkages with formal institutions. For example, it is a member of the International Confederation of Trade Unions (ICTU) which represents formal workers at the International Labor Organization (ILO). By being a member of ICTU, SEWA endorses international labor standards and promotes their respect among and for its members. Compliance with occupational safety and health standards has a beneficial impact on the environment. 34This Indian association is very active in the area of environmental protection. For instance, its project called “Green Livelihoods” aims to equip SEWA's members with energy efficient cooking stoves and rechargeable off-grid solar lanterns through sales at preferable conditions (ibid.). 35Another relevant contribution of SEWA to environmental protection and better labor practices is its support to waste pickers. Many waste pickers in India are women and are SEWA's members. The association has been organizing them through the creation of cooperatives where members can improve their working conditions and income. Through area meetings, SEWA helps its members develop awareness of their issues and rights. The association also provides training programs to upgrade the skills of waste pickers (SEWA, 2009). 36SEWA's experience is undoubtedly a very successful one. However, replications or similar examples in other countries are rather unusual. Informal jobs have very low productivity levels and many hours of work are needed to obtain very small incomes. Participating in meetings and activities of groups and associations is often perceived as wasted time. 37Examples of organizations of formal workers and employers accepting informal operators as members or forging alliances with associations of informal operators can be found in several countries. For instance, in Ethiopia, the Confederation of Ethiopian Trade Unions makes efforts to reach those informal sector employees who work in poor conditions as, for example, in the recently emerging floriculture sub-sector. In Ghana, the Trade Union Congress is making efforts to unionize informal employees. Almost all the national unions have desk officers responsible for the informal economy and some of them have already started to organize informal workers (De Gobbi, 2007). 38In addition, in Ghana, some existing informal workers' associations, such as the Makola Market Traders Association, Association of the Physically Challenged and the Madina Shoe Sellers Association are making efforts to join the TUC as associate members. In this country, employers' organizations have also forged alliances with associations of informal self-employed operators (ibid.). 39In Kenya, informal sector associations can become affiliate members of employers' organizations. Other examples can be found in Benin, South Africa, Argentina and Colombia (ibid.). 40In Senegal, since 1998, informal workers are represented within the Democratic Union of Workers of Senegal (UDTS) through an autonomous federation, the Informal and Rural Workers' Federation (FETRI). Trade union support to the informal economy consists of services such as information, education and awareness-raising on different issues (ibid.). 41The recent increasing interest and involvement of workers' and employers' organizations in environmental issues, particularly with regard to a responsible workplace, should have a direct impact on better environmental standards also for informal operators. 42An ILO pilot Decent Work Country Program in Ghana implemented between 2003 and 2005 had a component focusing on local economic development. A participatory approach was adopted and public-private forums created through the establishment of local committees. These committees include representatives of local public authorities, the private sector and the civil society. Their purpose was to allow groups that are traditionally excluded from decision-making to be heard and involved. Informal operators were also members of the committees. They contributed to finding ways to help informal agents formalize. Through thematic discussions, knowledge and information were exchanged and collective decisions made. Several informal businesses were formalized through registration (www.ilo.org). 43The project undoubtedly achieved positive results in improving the labor practices of informal operators. At present, local committees are still being organized and used in the country thanks to the pro-active role of local public institutions. 44In many African countries, radio stations are the only viable mass media that can reach a large number of small and micro businesses including in the informal economy (DCED, 2010). Through radio programs it is possible to reach informal operators and brief them on techniques and processes which can improve their social and environmental performance. 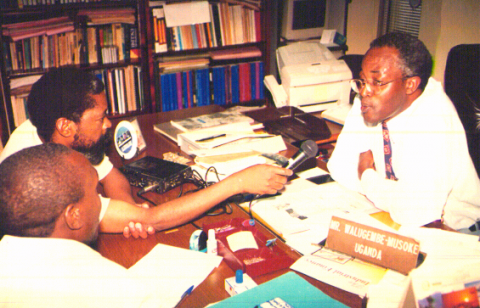 45An ILO project in Uganda and Ghana implemented in the early 2000s gave voice to informal business agents by discussing their issues on radio stations and inviting policy-makers to respond via telephone in broadcasts (ILO, 2009). Radio programs provided to SMEs business information, advice, platforms for debate on business issues, and a means through which advocacy for policy change can take place (DCED, 2010). 46Radio stations advertised and were directly involved in the organization of business to business trade fairs where entrepreneurs could meet and learn about the availability of different business services, new equipment, etc. One of these events in Uganda was attended by the President of the country (ibid.). Figure 1. A Ugandan official being interviewed as part of the ILO radio project. 47Other very successful initiatives include the organization of seminars and training courses on making and packaging milk products and on poultry management, and broadcasting technical advisory services from specialized companies and technicians, also on medicinal plant production (DCED, 2010). 48Besides radio stations, TV channels are also powerful media which can reach informal entrepreneurs and transmit knowledge to them on how to improve their social and environmental performance. An ILO project implemented in 2006 in China supported the broadcast of a TV series entitled, “My future is not a dream”, on Sichuan TV aimed at promoting business creation and development. A telephone hotline was also established to answer questions from the audience on how to start and improve a business. This initiative was organized in close collaboration with public institutions, in particular the Ministry of Labor and Social Security. Between 1.0 and 1.1 million people watched the TV program (ILO, 2006). 49The main objective of the program was to change the opinion and behavior of viewers. Both a questionnaire-based survey and a telephone survey reveal a very strong positive impact of the TV series on encouraging watchers to start or develop a business (ibid.). 50The target group of this initiative was migrants, but the application of the tool described herein could focus on informal entrepreneurs to improve their social and environmental attitude. Figure 2. An informal worker in Uganda listening to business information and advice via the radio broadcast. 51The main source of skills in developing countries is informal apprenticeship through master craftspersons. However, this type of training presents decent work deficits, and sometimes poor quality and level of skills (Nübler et al., 2009). 52In 2008, the ILO conducted a field study in Tanzania. One conclusion is that to upgrade the skills of informal agents, informal apprenticeship must be complemented by formal training, particularly in theoretical skills, new technologies and core skills (ibid.). Such skills should cover also environmental friendly practices and technologies. 53The study reveals that the ability of potential beneficiaries to pay for such courses is limited. So, financial arrangements from public institutions to finance complementary training courses are needed (ibid.). 54The actual impact of such financial arrangements cannot be assessed because at present no experience showing a concrete application of this tool exists. A major obstacle in the implementation of complementary formal training is the difficulty in identifying sources of public funding, especially in poor countries. 55The ILO has a long experience in developing training tools for enterprise development in the informal economy. Traditionally, these tools have focused on the social dimension of labor. Recently, a few of these training packages have been revised and an environmental component is being added. Such tools include Know About Business (KAB), Start and Improve Your Business (SIYB), Gender and Entrepreneurship Together (GET Ahead), My Coop, and Training for Rural Economic Empowerment (TREE). 56It is too soon to know about the impact of the application of these tools in terms of their contribution to the creation of sustainable enterprises and to the improvement of the social and environmental performance of informal operators. 57The main challenge in upgrading and implementing these training packages is making sure that those who are in charge of upgrading the tools and the trainers who will use the tools have adequate and appropriate technical knowledge of both social and environmental issues. 58A good illustration of the application of this tool is the case of a rural district in Kenya in the forestry sector. 59Local public authorities were concerned about the high number of injuries and accidents reported in informal sawmills. To remedy the situation, local authorities organized meetings with small informal firms and larger sawmillers who sometimes subcontracted the informal ones. Labor inspections focusing on occupational safety and health standards were conducted with the support of the larger sawmills, and logging permits from public authorities and subcontracting from larger employers were granted only to those informal firms that complied with OSH standards (Nyambari, 2007). 60The situation improved remarkably both in terms of safer working conditions and of less illegal logging. However, a replication of this approach in the quarry industry in the same district failed miserably (ibid.). 61Despite the positive results that can be obtained through the application of this tool, poor countries often have an inadequate number of labor inspectors (De Gobbi, 2007) and informal firms are often neglected. 62The list of tools to improve the social and environmental performance of informal enterprises presented in the present paper is not an exhaustive one. However, what this article shows is that ways to reach informal businesses and change their attitude do exist. In most cases, the tools described have been used and concrete applications have been identified. 63The findings from the description of applications indicate that a specific focus of projects and experiences on informal enterprises is often missing. If the contribution of the informal economy to environmental protection is deemed relevant, then a more focused approach could yield more positive results in terms of better social and environmental business practices. 64In addition, in those cases where informal firms are among the beneficiaries of the application of a specific tool, the impact of such a tool on informal businesses is usually not monitored and reported. 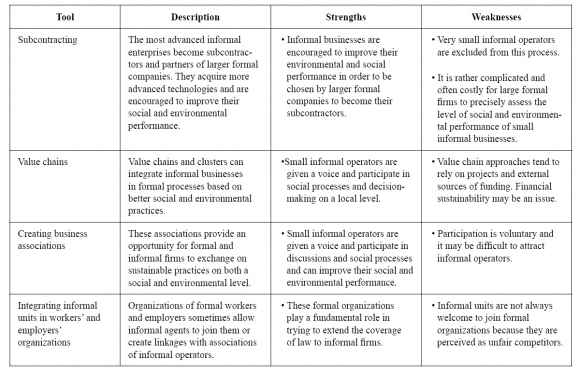 Since, as mentioned earlier, a large majority of firms in poor countries are informal and the informal economy is a cross-cutting issue in the framework for sustainable enterprises, it would be appropriate to always monitor and report on the effect of specific measures for enterprise creation and development on informal operators. 65The author is grateful to Merten Sievers, Gulmira Asanbaeva, Joni Simpson and Stephan Ulrich from the Small Enterprise Program of the ILO for the information they provided on projects they have been working on. Appreciation is expressed also to Markus Pilgrim, head of the Small Enterprise Program for authorizing the publication of the paper. Special thanks are due to Christine Vuilleunier for editing and formatting the article, as well as to Matthew Pavitt for selecting photos. 66The author does not guarantee the original source of the photos. They should have been taken by ILO project staff members, to whom deep appreciation is expressed. Bangasser, P.E. (2000), The ILO and the Informal Sector: An Institutional History. Employment Sector, Working Paper No. 9, ILO, Geneva. De Gobbi, M.S. (2011), Mainstreaming Environmental Issues in Sustainable Enterprises: An Exploration of Issues, Experiences and Opptions. Employment Working Paper No. 75, ILO, Geneva. ― (2007), Flexibility and Security in Labor Markets of Developing Countries: In Search for Decent Work for All. Employment Policy Papers No. 6, ILO, Geneva. Higman, S.; Poole, N. (2009), Managing Social and Environmental Responsibility. School of Oriental and African Studies, London. Hutchinson, A. and Chaston, I. (1994), “Environmental Management in Devon and Cornwall's Small and Medium Sized Enterprise Sector”, Business Strategy and the Environment, Vol. 3.
International Labor Organization (2011), Growth, Employment and Decent Work in the Least Developed Countries. Report of the ILO for the fourth UN Conference on the Least Developed Countries, Geneva. ― (2009), The informal economy in Africa: Promoting transition to formality: Challenges and strategies. Geneva. ― (2008), Employment and Labor Market Implications of Climate Change. GB.303/ESP/4, Committee on Employment and Social Policy, Geneva. ― (2007a), Conclusions Concerning the Promotion of Sustainable Enterprises. International Labor Conference, Geneva. ― (2007b), The Sustainable Enterprise Program: Strategic Framework. Employment Sector, Geneva. ― (2007c), An Operational Guide to Local Value Chain Development. Geneva. ― (2006), SIYB China Draft Review of Output and Impact of Pilot Mass-Media Based Entrepreneurship PromotionProgram, Geneva. ― (2002), Resolution Concerning Decent Work and the Informal Economy. International Labor Conference, Geneva. Nyambari, S.T. (2007), Improving Labor Legislation, Labor Administration and Labor Inspection. prepared for ILO, Geneva. 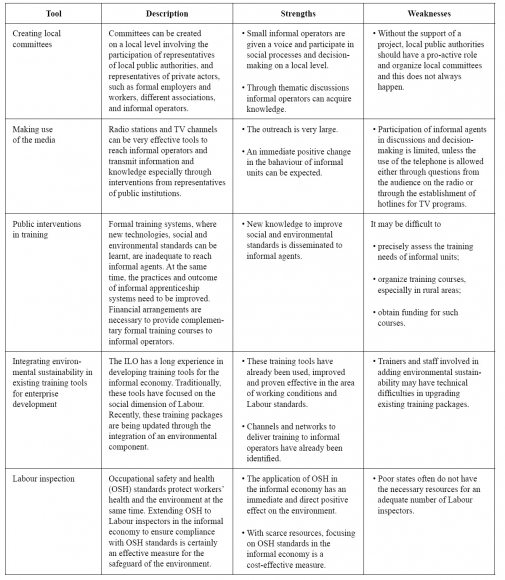 Nübler, I.; Hofmann, C.; Greiner, C. (2009), Understanding Informal Apprenticeship - Findings from Empirical Research in Tanzania. Employment Sector Working Paper No. 32, ILO, Geneva. SEWA (2009), Lasting Solutions for Development Challenges. Global Financial Crisis and India's Informal Economy: Review of Key Sectors. UNDP India. UNEP. (2011), Towards a Green Economy: Pathways to Sustainable Development and Poverty Eradication.Nairobi. Vickers, I.; Vaze, P. (2009), SMEs in a Low-Carbon Economy. Centre for Enterprise and Economic Development Research, Final report for BERR Enterprise Directorate, London. Vogel, D. (2006), The Market for Virtue: The Potential and Limits of Corporate Social Responsibility. Washington D.C., The Brookings Institution. 1 Decent work is productive work for women and men, in conditions of freedom, equity, security and human dignity (www.ilo.org). 2 This was the issue discussed at the thematic session entitled “Creativity and integration of the informal sector” at the international conference “Reconciling poverty eradication and quality of the environment: What are the innovative solutions?” organized by Veolia Environment Institute and Agence Française de Développement and held in Paris on 27-28 June 2011.